BECOMING A MANAGER offers thoughts and tools to help you in your transition to a management role, based on the advice of experienced managers in developing the necessary performance-based skills. You need to learn to manage, not just be focused on the completion of your own work, and to develop important new skills and competencies. Patrick Cunneen provides a simple-to-use tool kit for continuous learning and personal growth. Across the world, being promoted to manager is seen as a validation of career success. Professionals who spend all of their college education learning about engineering or accountancy or law have spent their early years applying that learning as an individual contributor and have had little opportunity to study or practice being a manager and leading a team. Whether you work in industry, professional services, the public service, or not-for-profit organisations, the challenge of the transition into a management role cannot be underestimated. Not satisfied with drawing on his own extensive international experience, the author has interviewed highly experienced and successful managers in the US, UK, Ireland and Asia, who openly shared their experiences and insights, warts and all! Part One of this book explores the essential transition that takes place from being an individual contributor and team player to becoming a manager – from being focused on your own work to being focused on the work of others. Part Two highlights important skills and competencies in managing people, as a ‘tool kit’ to support you on your journey of continuous learning and personal growth. While the key objective of BECOMING A MANAGER is to help and support newly-appointed managers through their transitions into management, it should also be of interest to HR and Employee Development departments as they seek to attract, develop and retain management talent, and to would-be entrepreneurs, considering starting their own business. There's not much theory here. Hopefully in its place, you'll find an opportunity to reflect on sound practical advice and good common sense. Giving Feedback – or Are You Bullying? Email May Be Communications – But Is It Listening? Cunneen has interviewed highly experienced and successful managers in the US, UK, Ireland and Asia, who shared their insights in this self-help book aimed at newly promoted managers. As Cunneen notes, the responsibility of management is different to excelling at your previous job and involves a range of roles – adviser, leader, HR guru, strategist, as well as managing yourself, sometimes the hardest task new managers face. It explores the transition from being an individual contributor and team player focused on your own work to becoming a manager focused on the work of others. It highlights important skills in managing people and provides a tool kit to support managers on their journey of continuous learning and personal growth. The first section of the book focuses on the early days in a new role and contains advice on delegation and empowerment and the importance of listening and maintaining good relationships with former peers. The second section provides advice on how to manage yourself in terms of time and delegation. There’s also pointers on addressing performance and giving feedback. The book should be of interest to HR departments as they seek to attract, develop and retain management talent. 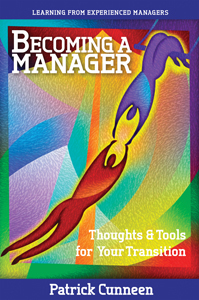 Transitioning into a management role is a major challenge and author Patrick Cunneen has produced an easily accessible book here for newly appointed managers. The first section focuses on the early days in a new role and contains solid advice on delegation and empowerment, the importance of listening and maintaining close relationships with former peers, for example, organisational change consultant. The second section provides a tool-kit of people management skills, including how to manage yourself in terms of time and delegation. The book also addresses how to communicate effectively, how to select good performers for various roles and how to manage change in organisations.